McMansion by Justin Scott, a Mysterious Review. 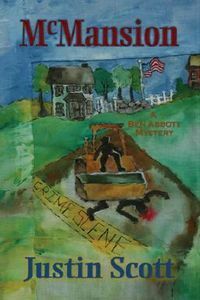 Review: Justin Scott's 4th book featuring realtor and private investigator Ben Abbott, McMansion, is a rather loosely constructed mystery populated with characters that seem more contrived than real. Ben has been hired to look into an environmentalist's background by the attorney defending him, accused of the murder of a local real estate developer. The young man was arrested atop a bulldozer under which lay the crushed corpse. Ben quickly discovers that many of the developer's detractors had the means and a motive to kill the man, but which of them also had the opportunity to do so? McMansion doesn't break any new ground here and contains a fairly routine outline of a murder mystery. For all practical purposes, Ben identifies the culprit early on when he ponders the crime scene. That leaves a lot of pages to fill. What could have made the book more interesting would have been development of good, complex characters and incorporating them and said outline into a new environment to make it more of a puzzle. McMansion tends to fail in both regards. With only one or two exceptions, the characters here lack the multi-dimensionality that provides depth to a story. Even Ben seems a bit flat here. He doesn't want the case he's working on and resents the obligation to continue. Whining about the assignment in particular, and the title structures in general, doesn't endear him to the reader. The setting also presents something of a problem. The fact that large homes on large lots are being purchased by people with more money than taste isn't a criminal act and by itself simply doesn't provide a strong foundation upon which to build this story. And the implication that the reason these houses exist is primarily due to the greed of developers and the corruption of zoning officials is absurd, even in a work of fiction. There is a decent, credible murder plot buried here somewhere, but it seems Scott would rather bemoan what he perceives to be the sorry state of housing in Connecticut than craft an interesting mystery around the death of one of its developers. Acknowledgment: Poisoned Pen Press provided an ARC of McMansion for this review.